GREENVILLE – Since learning in November their unit had been chosen to represent Area 3 at the 2019 Navy ROTC National Orienteering competition in California, Greenville students have been busy raising funds to make the trip. 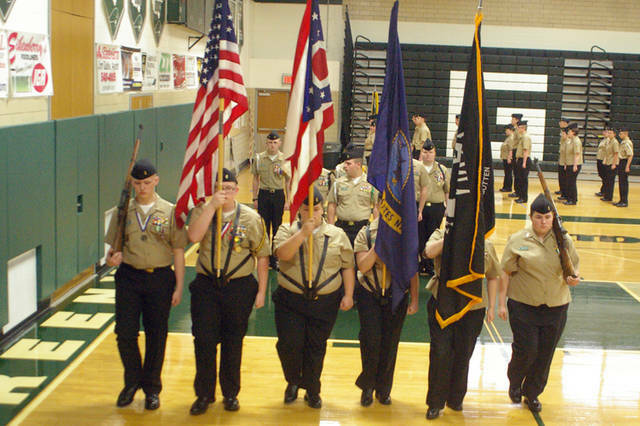 Greenville is the only Ohio high school ROTC program within Area 3 to be selected to compete. Set for Feb. 14-19, the trip will cost each attendee about $1,200, which includes their flight, meals and lodging. “We need to raise about $3,500 more, which would significantly help out in reducing expenses,” said Capt. Scott Eberwine, who along with Chief Stephen Eldred will be accompanying the 10 students who have been selected to participate in the Orienteering competition in Agua Dulce, Calif.
Several in the community have already supported the NJROTC by making donations, Eberwine said. Eberwine said he wanted to credit Greenville Board of Education member Fred Matix for the support he gives the ROTC program. Matix, the captain said, has been instrumental in urging people to support the monthly fish fries at Greenville’s American Legion Post, which in turn provides monetary support for the high school ROTC program. “One of the reasons we are able to go on the orienteering trip last year and again this year is through the efforts of Fred Matix. He’s wonderful,” Eberwine said. Unit Commander and Orienteering Commander Eli Hartsock, a senior cadet, will be one of the 10 students traveling to California. Hartsock, 18, said he is looking at attending Miami University and joining their ROTC program following high school graduation. The 10 students selected to travel to California had to meet certain criteria, Eberwine said, including both the high school’s academic and ROTC unit’s requirements. “It requires students to have good grades and meet school and unit requirements to go on these field trips. We also looked at their abilities on how well they’ve done orienteering. Everybody that’s going has demonstrated abilities,” he said. The students have a couple more weekend orienteering practices before leaving for nationals. Once there, they’ll have one day to get acclimated to the area in order to complete the competition’s challenges, which test an individual’s navigational skills by using maps and compasses to navigate from one point to another in unfamiliar terrain. Students will compete individually, but are divided into junior or varsity level groups. “We do not go out as a group. It’s individual competition. It’s your own ability on how you can use land navigation maps to get to the next check point,” Eberwine explained. Not only will the 10 Greenville students compete, so will their adult instructors. If you would like to support the NJROTC students’ trip to nationals, you may send a check to the high school, NJROTC Boosters, 100 Green Wave Way, Greenville, 45331. Make checks payable to the NJROTC Boosters. Green Wave Navy is heading to the 2019 Navy JROTC National Orienteering Invitational for the 2nd consecutive year. The Greenville Senior High School Naval Reserve Officer Training Corps (NJROTC) has just been notified for the 2nd consecutive year, that they are the only school in Ohio with in Area 3 to participate in the 2019 Navy JROTC National Orienteering Championship. Orienteering is a group of sports that requires navigational skills using a map and compass to navigate from point to point in diverse and usually unfamiliar terrain. Participants are measured on speed, accuracy, and the ability to find control points in the proper order. Participants are given a topographical map, usually a specially prepared Orienteering map, which they use to find control points. Navy Nationals will take place on Friday, Saturday and Sunday, 15 - 18 February 2019, At Vasquez Rock Regional Park in Agua Dulce, CA. This will be the second time in the last two years that the Green Wave Navy will represent Area 3 and Greenville. The estimated cost for a full team to attend and compete for the National Trophy this year will be about $18,000, which goes beyond the normal activities that were scheduled and budgeted for. Donation are needed and requested for the cadets to take advantage of such a great opportunity and rare opportunity. 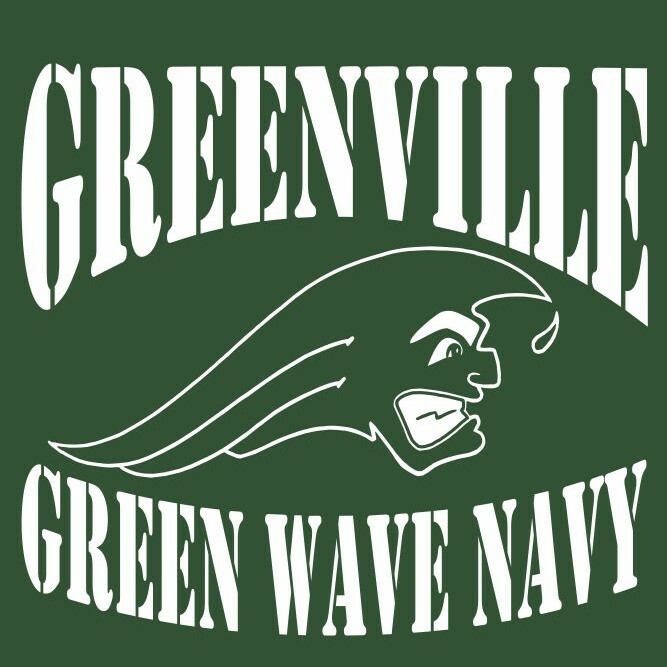 If you would like to support the Green Wavy Navy please, send any donations to the Greenville Green Wave Navy at, 100 Greenwave Way, Greenville, OH 45331. You may also contact Captain Scott Eberwine (seberwine@gcswave.com) or Chief Stephen Eldred (seldred@gcswave.com) at (937) 548-4188 X1118 if you have any questions. The Greenville High School Navy JROTC has been named a Distinguished Unit with Honors by the U.S. Navy. GREENVILLE — The Greenville High School Navy JROTC has been recognized by the U.S. Navy as a Distinguished Unit with Honors, making it one of the top two schools in the State of Ohio. This is only the second time in school history the unit has been designated as a Distinguished Unit and the first time with honors. The cadets volunteered more than 3,400 hours of community service this last year — a 400-percent increase from the previous year. Cadets participated in various activities throughout the year. They were recognized as one of the top orienteering schools within the 12 states that make up Area 3 and received an invitation to the Navy National Orienteering Championships in Orlando, Florida, this past February. The Units Color Guard is extremely busy all year presenting the Colors for the high school and participating in parades, special functions and professional sporting events. This last year, the Green Wave Navy was called twice to present the Colors for the Cincinnati Reds and were invited to present the Colors for Game 6 of the Columbus Blue Jackets playoff game against the Washington Capitals. During the summer, they will steam at full speed just as they have done in years past. 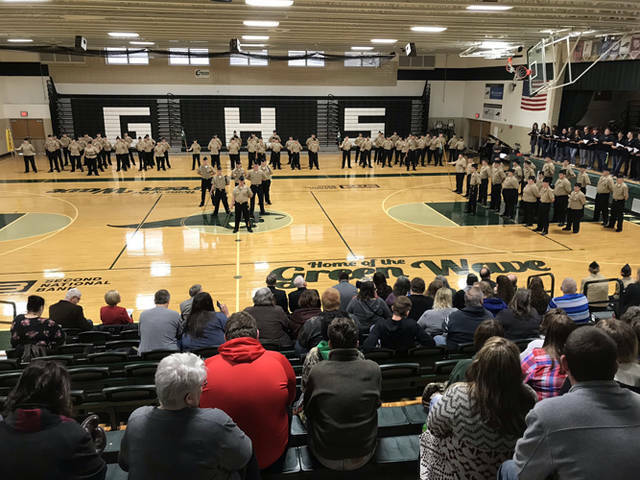 They will attend three camps in June along with holding training on Tuesdays and Thursdays throughout the summer to help incoming cadets and end their summer with assisting the Darke County Fair Board with one of the large parking lots during the Great Darke County Fair. The Green Wave Navy held its first awards ceremony. GREENVILLE – The Green Wave Navy held its first awards ceremony on May 2 in the school cafeteria. These awards were presented in front of the student body in years past. “We felt that it was important for our parent to see the accomplishments and rewards that their cadets had made over the school year,” said Chief Stephen Eldred the Naval Science Instructor at Greenville Senior High School. Awards that are to be presented at the underclassmen awards ceremony to be help on Wednesday. 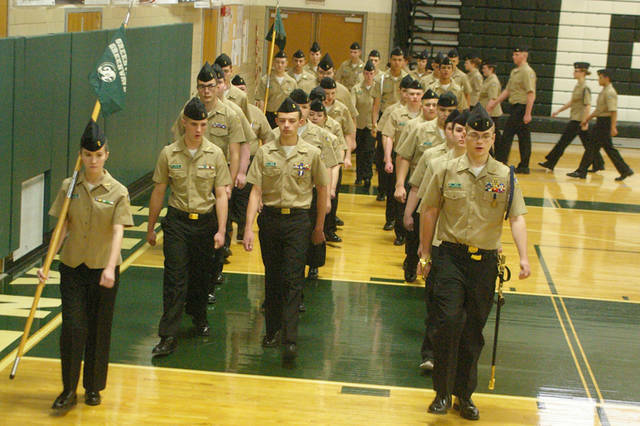 The Greenville Senior High School has a Naval Junior Reserve Officer Training Corps program has 103 students enrolled. GREENVILLE – Greenville Senior High School has a Naval Junior Reserve Officer Training Corps program that is being recognized throughout the country. 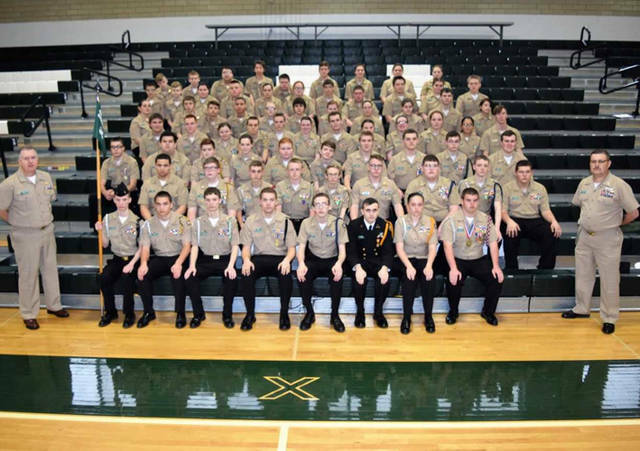 For the 2016-17 school year, the Green Wave Navy was recognized as the most improved unit in Area 3 along with receiving the NJROTC Unit Achievement Award. Area 3 now consists of 54 schools from West Virginia to Nebraska and Kentucky to Michigan. For the most recent school year (2017-18), the unit was recognized as a Distinguished Unit with honors, the highest unit award offered to a NJROTC unit. Greenville was one of only two schools in the state of Ohio to receive this award, and it awarded to only the top 20 percent nationally. The program has been growing in the last few years and currently has 103 students enrolled. The public is invited to this years Pass and Review ceremony, which will be held at 11 a.m. Nov. 29 in the Greenville Senior High School gymnasium. The NJROTC program is not designed to get cadets (students) to join the military, but instead it teaches cadets respect and responsibility. NJROTC is a group that acts like a family. When any cadet has a problem with any subject in school, the other cadets come together to help explain the subject. They also are there to help when another member is going through a personal struggle. Another misconception is that joining the NJROTC means students must join the military. They do not have to join the military. There is a part of the class that is ridged like the military, but the students are not being forced to do anything. NJROTC is an extracurricular class. 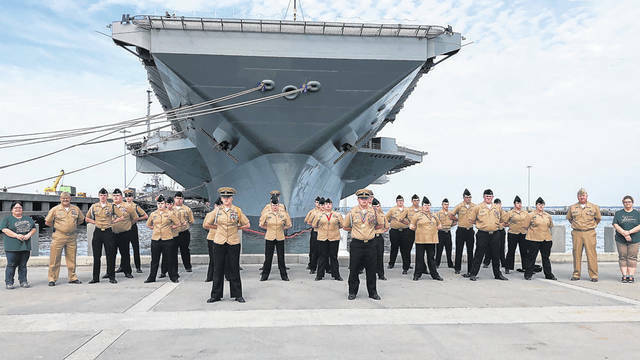 “The whole point of NJROTC is to make better citizens – to make students more aware of what is out there,” Naval Science Instructor Chief Petty Officer Stephen Eldred said. “It teaches them about history, manners and good citizenship. That is our whole point. They can get a benefit from us with no requirement to join the military, whatsoever. Eldred also is excited about the growth of young women in the unit. In the 2016-17 school year, the unit was only about 25 percent women. It is now close to 40 percent. Greenville would like to see the unit get closer to a 50/50 split. “The Navy requires us to teach equal opportunity, anti-bullying and sexual harassment courses. We don’t segregate or treat anyone different for any reason,” Eldred said. Because of its diversity in students, it also offers built-in tutors for students to help each other within the unit. “All students fit in somewhere into NJROTC,” Eldred said. Normally Thursdays are uniform days at the school and all members are expected to be in their uniforms for inspection. According to Eldred, the kids are taught military knowledge, discipline and a lot of respect. Through that, they learn self-reliance, independence, self-confidence and building their character. In order to maintain the NJROTC program, the U.S. Navy requires the school to have a minimum of 10 percent of the school’s population in the program. This year the Green Wave Navy has just over 13 percent of the school’s enrollment. Recruitment is very important, and the Green Wave Navy is excited about what the program has to offer Greenville’s kids, which includes a wealth of opportunities and activities. Activities include various drill teams, offered in both armed and unarmed versions. The armed and unarmed IDR drill teams perform per a defined set of drill maneuvers. Armed and unarmed exhibition drill teams are different in where cadets invent their own routines … and do it silently. Color Guard is another activity the public sees performing often. Students must pass certain standards to qualify to be on the Color Guard. In the past year the Color Guard participated in most of the local parades, Memorial Day events at Pleasant Hill, Ansonia and Abbottsville. It has also presented colors at Columbus Blue Jackets, Dayton Dragons and the Cincinnati Reds games. Most recently, the Green Wave Navy Color Guard presented colors during a Miami University football game in concert with Miami’s marching band. One activity offered is orienteering; the unit competes at the national level. Orienteering is when students are given maps with indicators on it of where flags and markers are out in the woods. The compass is used with the map to find those flags and indicators. The goal is to find the most indicators the fastest. A whistle is used if a person gets lost. For the 2017-18 school year the unit was one of just two schools to represent Area 3 in Navy Nationals held in Orlando, Florida. Another program, the Civilian Marksmanship Program, is available for students to join. The Civilian Marksmanship Team competes using pneumatic air rifles to shoot .177 caliber pellets. In November, the team went to CMP Headquarters, in Port Clinton to compete. American shooter Ginny Thrasher won the first gold medal of the Rio Olympics, in August of 2016, pulling off an upset in the women’s 10-meter air rifle event. She was an NCAA champion at West Virginia University, competing in her first Olympics. Other NJROTC activities include the Athletic Team, Academic Team, college visits and military base orientation trips to places like Norfolk, Virginia, and Paris Island. This year the instructors are planning to take a trip to Washington, D.C. in the second semester time frame. To accomplish these many activities, the unit requires financial support. In the last two years it has received more the $10,000 in donations each year. The funds are used to help reduce the cost of activities for the cadets and to pay for the competition they participate in. This year fundraising efforts have fell short by more than $6,000 in donations. The unit is asking for the residents of Greenville and Darke County to show their support by helping with a small donation. All donation can be sent to the Green Wavy Navy, 100 Greenwave Way, Greenville, OH 45331. Checks should be made out to Greenville NJROTC Boosters. 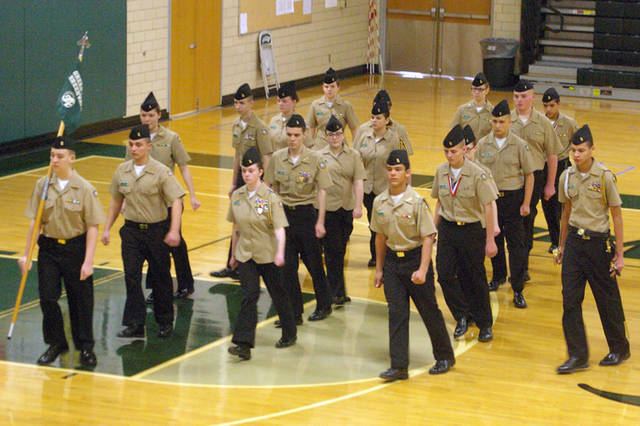 GREENVILLE – Greenville Senior High School has an NJROTC (Naval Junior Reserve Officer Training Corps) program that is being recognized throughout the country. For the 2016/2017 school year, the Green Wave Navy was recognized as the most improved unit in Area 3 along with receiving the NJROTC Unit Achievement Award. Area 3 now consists of 54 schools from West Virginia to Nebraska and Kentucky to Michigan. For the most recent school year (2017/2018), the unit was recognized as a Distinguished Unit with honors (the highest unit award offered to a NJROTC unit). They were one of only two schools in the state of Ohio to receive this award and it’s awarded to only the top 20 percent nationally. The program has been growing in the last few years and currently has 103 students enrolled in the program. The public is invited to this year’s Pass and Review ceremony which will be held on Nov. 29, 11 a.m., in the Greenville Senior High School Gymnasium. The NJROTC program is not what most people think. The program is not designed to get cadets (students) to join the military but instead it teaches cadets respect and responsibility. NJROTC is a group that acts like a family. When any cadet has a problem with any subject in school, the other cadets come together to help explain the subject. They are also there to help when another member is going through a personal struggle. Another misconception is that joining the NJROTC means students must join the military. They do not have to join the military. There is a part of the class that is ridged like the military, but students are not being forced to do anything. NJROTC is an extracurricular class. Chief Eldred said, “We have kids from every facet of the school that represent the full spectrum of academic achievement and activity involvement. We have cadets that are involved in sports, band, Wavaires, the school academic team, etc. They all come together as one big family and look out for each other.” Chief Eldred is also very excited about the growth of young women in the unit. In the 2016-2017 school year, the unit was only about 25 percent women. It is now close to 40 percent. “We would like to see the unit get closer to a 50/50 split. The Navy requires us to teach equal opportunity, anti-bullying and sexual harassment courses. We don’t segregate or treat anyone different for any reason.” Because of its diversity in students, it also offers built-in tutors for students to help each other within the unit. “All students fit in somewhere into NJROTC,” Chief Eldred said. In order to maintain the NJROTC program, the U.S. Navy requires the school to have a minimum of 10 percent of the school’s population in the program. This year the Green Wave Navy has just over 13 percent of the school’s enrollment. Recruitment is very important, and they are very excited about what the program has to offer our kids, which includes a wealth of opportunities and activities. Activities include various Drill Teams, offered in both armed and unarmed versions. The armed and unarmed IDR drill teams perform per a defined set of drill maneuvers. Armed and unarmed Exhibition Drill Teams are different in where cadets invent their own routines…and do it silently. Color Guard is another activity the public sees performing often. Students must pass certain standards to qualify to be on the Color Guard. In the past year the Color Guard participated in most of the local parades, Memorial Day events at Pleasant Hill, Ansonia and Abbottsville. It has also presented colors at Columbus Blue Jackets, Dayton Dragons and the Cincinnati Reds games. Most recently, the Green Wave Navy Color Guard presented colors during a Miami University football game in concert with Miami’s marching band. One activity offered is Orienteering, the unit competes at the national level. Orienteering is where students are given maps with indicators on it, where flags and markers are out in the woods. The compass is used with the map to find those flags and indicators. The goal is to find the most indicators the fastest. A whistle is used if a person gets lost. For the 2017/18 school year the unit was one of just two schools to represent Area 3 in Navy Nationals held in Orlando, FL. Another program, the Civilian Marksmanship Program (CMP), is available for students to join. The Civilian Marksmanship Team competes using pneumatic air rifles to shoot .177 caliber pellets. In November, the team went to CMP Headquarters, in Port Clinton, Ohio to compete. American shooter Ginny Thrasher won the first gold medal of the Rio Olympics, in August of 2016, pulling off an upset in the women’s 10-meter air rifle event. She was a National Collegiate Athletic Association (NCAA) champion at West Virginia University, competing in her first Olympics. Other NJROTC activities include the Athletic Team, Academic Team, college visits and military base orientation trips to places like Norfolk, VA and Paris Island. This year the instructors are planning to take a trip to Washington D.C. in the second semester timeframe. To accomplish these many activities, the unit requires financial support. In the last two years they have received more the $10,000 in donations each year. The funds are used to help reduce the cost of activities for the cadets and to pay for the competition they participate in. This year, fundraising efforts have fallen short by more than $6,000 in donations. The unit is asking for the residents of Greenville and Darke County to show their support by helping with a small donation. All donations can be sent to the Green Wave Navy, 100 Greenwave Way, Greenville, OH 45331. Please make all checks out to Greenville NJROTC Boosters. GREENVILLE – The Greenville Senior High School Naval Reserve Officer Training Corps (NJROTC) has just been notified for the second consecutive year, that they are the only school in Ohio within Area 3 to participate in the 2019 Navy JROTC National Orienteering Championship. Navy Nationals will take place on Friday, Saturday and Sunday, Feb. 15-18, 2019, At Vasquez Rock Regional Park in Agua Dulce, Calif. The estimated cost for a full team to attend and compete for the National Trophy this year will be approximately $18,000, which goes beyond the normal activities that were scheduled and budgeted for. Donations are needed and requested for the cadets to take advantage of such a great and rare opportunity. If you would like to support the Green Wavy Navy, please send donations to the Greenville Green Wave Navy at 100 Greenwave Way, Greenville, Ohio 45331. You may also contact Captain Scott Eberwine (seberwine@gcswave.com) or Chief Stephen Eldred (seldred@gcswave.com) at (937) 548-4188 X1118 if you have any questions.